Dubai, part of the United Arab Emirates, is located along the coast of the Arabian Gulf, mixing old and new. A vibrant mixed city with the nationalities of the world well represented in a muslim country with muslim values and culture. One of Dubai's iconic buildings. The hotel is located along the beach in Jumeirah and is designed in the shape of the sails of an Arabian dhow. 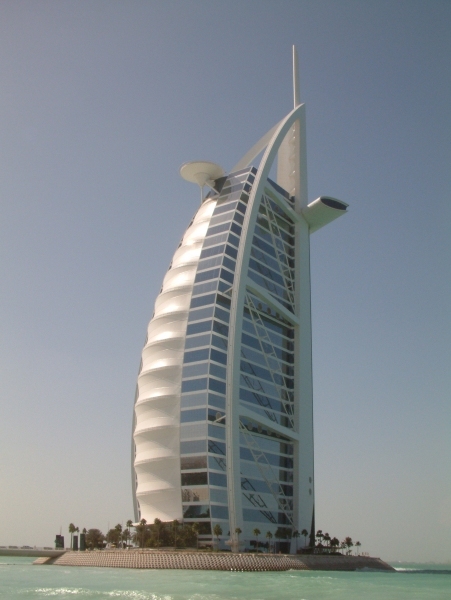 Burj Al Arab is amongst the most luxurious hotels in the world and it stands at 321 metres of height, 280 metres offshore on a man-made island. The hotel acts as a resort, spa and conference venue amongst other things. The Burj Khalifa is an enormous tower hovering over Dubai up to a staggering height of 828 metres. At the time of writing it was the tallest man made structure in the world. Construction began in 2004 and the Burj was officially opened in January 2010. It was originally called the Burj Dubai but as part of a financial rescue package for Dubai from Abu Dhabi, the tower was renamed Burj Khalifa in honour of the president of the UAE, Khalifa bin Zayed Al Nahyan. The Burj Khalifa also features an impressive fountain and observation deck as popular attractions. Dubai, being part of a predominantly Muslim country, is home to many mosques. Some of the most impressive being the Grand and Jumeirah Mosques. Jumeirah Mosque is open to visits to non-muslims and is beautifuly lit up at night. The world's largest man-made islands. The islands are in the shape of palms trees with a trunk and the fronds with a crown. The islands are home to residents and also feature resorts and fancy hotels for those wishing to enjoy a stay on the islands. A modern souk with decent shopping, an extensive waterway with nice cafés and restaurants. Worth a quick look and stroll to see the new approach to souks. There is no shortage of malls in Dubai. You can go to Dubai Festival city for a waterfront shopping experience. Or you can go to the enormous Mall of the Emirates with over 400 retailers and the Ski Dubai skiing facility. You can find more information on the Mall of the Emirates at Mall of the Emirates. The city is located on the coast of the Arabian golf and the beaches are located along Jumeirah Road. The water is very warm and the sand is a beautiful soft white sand. Note that there are both public and private beaches. Summer temperatures are high with high humidity making the beach unpleasant until sunset. There are great malls in Dubai. The shopping is fantastic with all the designer brands you can think and wish of. There are plenty of restaurants in nice locations offering a variety of international cuisine. Go on a desert safari and experience 4x4 excitement bashing through the desert dunes. Made with lamb or chicken, shawarma is served in an arabic wrap and it is usually served with lettuce, tomatoe, onions and a garlic sauce. Fried chickpea with spices served as a shawarma above or on it's own with tahini, garlic sauce and/or hummus. A chickpea, tahini, lemon juice, olive oil, garlic and spices paste. A shell stuffed with a filling of spiced meat and rice fried until brown. There are plenty of resorts and hotels in Dubai. Many of the main hotel sites will have listings for you in Dubai. Find Dubai Hotels. There are a few decent hostels on the island for the budget traveler. You can find hostels by using our booking engine for Dubai Hostels. Dubai airport is a modern and very large international airport. Great attention to detail and the well being of passengers has been invested in the airport making it one of the prettier and more comfortable and agreeable airports around. Their approach to passengers travelling with children is exceptional. Many visitors will need visas to enter Dubai so check your particular requirements before departure. Visit www.dubaiairport.com for more information. Dubai is a city built for the car. Highways are wide, petrol or gas is inexpensive and the heat is stiffling to walk. Find a rental car at Auto Europe. A metro train system runs efficiently covering the length of Dubai. Visit www.rta.ae for more information on transport options in Dubai. A good way to get around in this city for the car without having to rent one and navigate the roads. Dubai has an extensive bus system covering the major areas of the city. Arabic but many people speak English with many other foreigners speaking a variety of languages.